First System of Multiple Planets Found around a Sun-like Star. Apr. 15, 1999: Astronomers from four research institutions have discovered strong evidence for a trio of Jupiter-sized extrasolar planets that orbit the star Upsilon Andromedae. In a paper submitted to The Astrophysical Journal, scientists announce the first multiple planet system ever found around a normal star, other than the nine planets in our Solar System. The closest planet in the Upsilon Andromedae system was detected in 1996 by astronomers Geoffrey Marcy and R. Paul Butler from San Francisco State University. Now, after 11 years of telescope observations at Lick Observatory near San Jose, CA, the signals of two additional planets have emerged from the data. Astronomers from the Harvard-Smithsonian Center for Astrophysics (CfA) in Cambridge, MA, and the High Altitude Observatory (HAO) in Boulder, CO have independently found the two outer planets around Upsilon Andromedae. This team has been studying the star for more than four years at the Smithsonian's Whipple Observatory near Tucson, AZ. This first planetary system, found from a survey of 107 stars, offers the first suggestion that planetary systems like our own are abundant in our Milky Way Galaxy, which contains approximately 200 billion stars. SFSU researcher Debra Fischer said, "It implies that planets can form more easily than we ever imagined, and that our Milky Way is teeming with planetary systems." Image from SEDS WWW site at the University of Arizona. 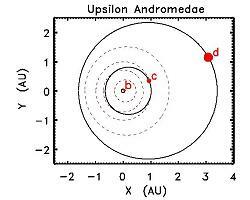 Upsilon Andromedae is the star closest to the center of the circle, bisected by the red-dotted line. Upsilon Andromedae is a bright star that is visible to the naked eye from the Northern Hemisphere, starting roughly in June. It is located about 44 light-years from Earth, and is roughly 3 billion years old, about two-thirds the age of the Sun. The innermost (and previously known) of the three planets contains at least three-quarters of the mass of Jupiter and orbits only 0.06 AU (8.9 million km) from the star. (One AU is the distance between the Earth and the Sun, approximately 93,000,000 miles or 149,000,000 km.) It traverses a circular orbit every 4.6 days. The middle planet contains at least twice the mass of Jupiter and takes 242 days to orbit the star once. It resides approximately 0.83 AU from the star, similar to the orbital distance of Venus. The outermost planet has a mass of at least four Jupiters, and completes one orbit every 3.5 to 4 years, placing it 2.5 AU from the star. The two outer planets are both new discoveries and have elliptical orbits, a characteristic of the nine other extrasolar planets in distant orbits around their stars. No current theory predicted that so many giant worlds would form around a star. "I am mystified at how such a system of Jupiter-like planets might have been created," said Marcy. "This will shake up the theory of planet formation," Robert Noyes, a professor of astronomy at Harvard-Smithsonian CfA and a member of the CfA-HAO team said. "A nagging question was whether the massive bodies orbiting in apparent isolation around stars really are planets, but now that we see three around the same star, it is hard to imagine anything else." Scientists had suspected that there was something strange about Upsilon Andromedae. The velocity variations that revealed the closest planet to the star in 1996 had an unusual amount of scatter. Not until early this year had enough observations been made of the star to confirm the presence of an additional planet, which explained some of the confusing pattern in the data. But another object still seemed to be tugging on the star. Both teams of astronomers considered astrophysical effects that could mimic the velocity signature from these planets, but no such effects are visible. A computer simulation by Greg Laughlin of U.C. 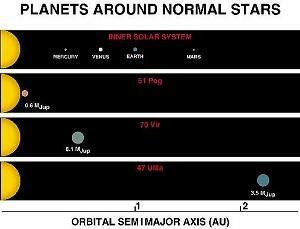 Berkeley suggest that these three giant planets could co-exist in stable orbits. One big question left to answer is how such a solar system arose. "The usual picture is that gas giant planets can only form at least four AU away from a star, where temperatures are low enough for ice to condense and begin the process of planet formation," said Timothy Brown of the HAO team. "But all three giant planets around Upsilon Andromedae now reside inside this theoretical ice boundary." The planets may have formed close to the host star, or, like balls on a billiard table, the planets may have scattered off each other, migrating into their current orbits from a more distant place of origin. The discovery of this multiple planet system suggests a new paradigm for planet formation where many small planets known as 'planetesimals' might develop in the disk of matter surrounding a star. Those planets that grow fastest would engage in a gravitational "tug of war" that weeds out some of the smaller worlds and determines which planets ultimately remain in orbit. "The Upsilon Andromedae system suggests that gravitational interactions between Jupiter-mass planets can play a powerful role in sculpting solar systems," said Butler. If these Jupiter-mass planets are like our own Jupiter, they would not be expected to have solid Earth-like surfaces. However these observations cannot rule-out Earth-sized planets, as their signature would be too weak to detect with current instrumentation.